It’s time for a quick break from art school! What’s an artist to do with his time off? Pay his bills? Hang out with friends? Don’t be silly. 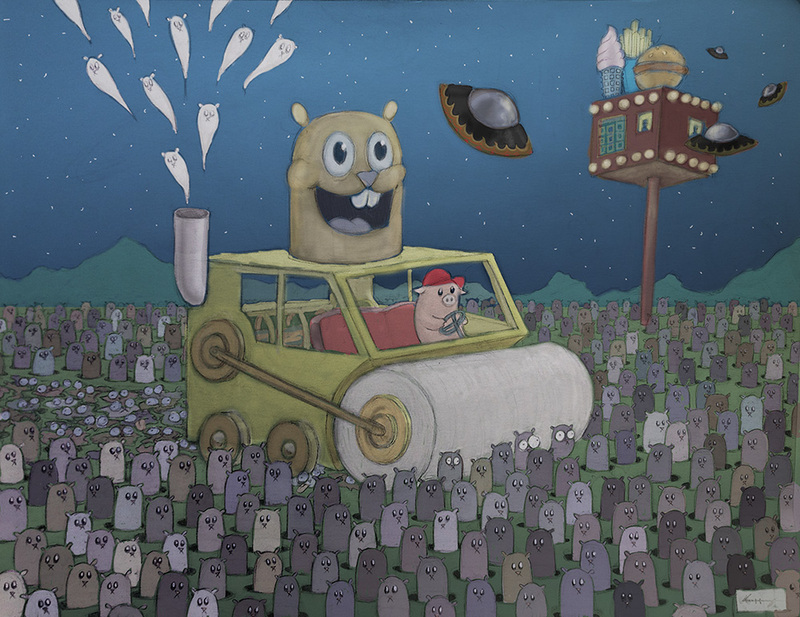 Of course, he will draw a piggy running over untold fields of groundhogs in his steamroller. One of the things I love about this one is all the subtext going on. But one of the things I hate the most about art is talking about all the subtext going on. “C’mon people, the message is obvious!” I think to myself, until absolutely everyone interprets it in their own weird way that doesn’t match mine at all. But I kind of like that too. Go ahead and have your own dumb opinion, I say, and I will just keep drawing the things. Eventually someone will start paying me for stuff like this, right? Right? SCORE: A pile of delicious burgers, and a shake. The East German judge gives it a schnitzel. When the children speak of the squish stomp car wash day you will finally know what this little piggy felt. Oh capricious groundhog days. Surely this pig is hogging the spotlight. Don’t get surly and slanderous because of the pun, it’s a hog killing groundhogs making them more grounded but much less hog. If only there were a cop on a motorcycle in the far corner, watching with judgemental corkscrew eyes but you can’t always get what you want. Sometimes you need to just imagine and be grateful that your mind can fabricate ways to make reality more insane.